The above matrix has the additional feature that its rows and columns all sum to . This number is a complex phase, that is, its squared magnitude is 1. So we can multiply by the complex conjugate of this and obtain an MNS matrix whose rows and columns sum to 1, which is the form given in the previous post, (other than I have swapped the columns around to match the literature). for all k (and where the “[ ]” means absolute value, which I can’t fix on the computer I’m using tonight because the POS doesn’t have a modern paint). The above matrix is fully characterized by its top left value. As a increases from 0 to 1, the top left value runs from 0 to (1 +- i)/2, and then on to 1. The squared magnitude is just a, so for each value of a other than 0 and 1, there are two solutions that are complex conjugates. Is there a way to generalize the above solution to 3×3 matrices? For the case of the tribimaximal matrix, in deriving the doubly magic version of the matrix I found that there was only the given solution (plus the replacement i to -i). This is just like the above general solution for the 2×2 matrices. So, for an arbitrary 3×3 matrix of probabilities that sum to unity is there always a unique (up to complex conjugacy) doubly magic version of the amplitude? Is the MNS matrix just lucky or what? Does the fact that the MNS matrix can be written to be orthonormal play a part in this? Recently, Kea observed that the CKM matrix can be written as the sum of 1-circulant and 2-circulant matrices. The CKM matrix defines the relationship between flavor eigenstates and mass eigenstates for the quarks. Her observation naturally suggests one should look also at the MNS matrix, which defines the relationship between flavor and mass eigenstates for the leptons. The form of the matrix is chosen so that the rows and columns are orthonormal. This is the mathematical definition of unitary, it means that when the matrix is multiplied by its conjugate transpose, it will give the identity matrix. The physics definition of unitary is a little looser, it only requires that probabilities sum to 1. For the case of a mixing matrix, probabilities are given by the squares of the absolute values of the entries. Conservation of probabilities means that the sum of the probabilities for any row or column is 1. Since in quantum mechanics, the phase of any quantum state is arbitrary, we can consider modifications to the tribimaximal matrix by multiplying any row or column by an arbitrary phase. The result will be a new matrix but its probabilities will be unchanged (and therefore consistent with experiment). Neutrino Oscillation .. Or Interference? Neutrinos are constantly being emitted by the sun in prodigious numbers. About 10^14 go through your body each second (maybe more if you supersize yourself like my old buddy Mario did). 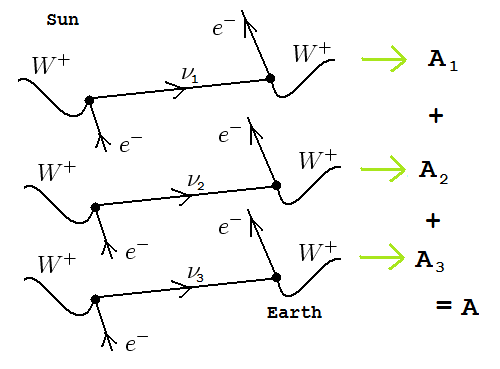 More technically, anti-neutrinos are created when neutrons decay into a proton + electron + anti-neutrino, and neutrinos are created when protons absorb electrons in the reverse process: proton+electron -> neutron + neutrino. These sorts of things happen to various atoms of the sun, depending on what sort of decay they are subject to, (beta decay or reverse beta decay, respectively), as well as proton-proton collisions that produce a positron a deuteron (PN), and a neutrino. However, not enough neutrinos seem to arrive on earth. This was known quite some time ago, see The Solar Neutrino Problem for the technical details as of 1998. The explanation for the deficit in neutrinos is now called “neutrino oscillation.” In the theory of neutrino oscillation, these solar neutrinos are “electron neutrinos”, and in their passage to the earth, they change form and become “muon neutrinos” or “tau neutrinos.” For those students who take their physics on faith, this is not a problem. But every now and then someone learns their theory just a little too well and begins to have doubts about how it can be that a particle can transform itself into another particle in vacuum. Yes, neutrino oscillation is a little strange, but it can be explained much more clearly, and kept in context with the rest of particle physics, by analyzing the problem as neutrino interference. This way neutrino oscillation can be described in a way that doesn’t confuse students. And such is the topic of this post. I’m adding Parkway Rest Stop to my blog roll. The blog roll here is not a list of stuff that I approve of, but just a convenient place to keep a list of blogs I like to read. I ended up directed to Parkway because of a comment at The Mind of Dr. Pion that pointed to this post, about Army tests, and cheating on them. And I’m wondering if Global Pioneering has moved on. His (well, her, according to Kea) website is coming up 404 now. Work on my paper on the Koide formula continues. I’m in the meson section. Things are going okay, but…., so many mesons, so little time. Here’s a short description of some coincidences in the heavy mesons. I already put up a formula for the angular excitations of the pions on physics forums. The bound states of hydrogen are, to lowest order, described by spherical harmonics, . The energy levels of these wave functions depend only on . The energies of these wave functions depend only on $n$, they are approximately electron volts. Since the energies do not depend on l or m, the energy states are degenerate. However some of these degeneracies are split at higher orders. At the lowest order, one ignores the spins of the proton and electron. Taking these into account we find a spin-spin effect. When the electron and proton spins are parallel, the energy is slightly different from when they are anti-parallel. The quarks, having charges between 0 and , are supposed to be composed of a mixture of charged and neutral preons. The masses of the quarks cannot be determined experimentally because colored states never appear alone. The simplest particles made from quarks are the mesons, which are composed of a quark and an antiquark. And the simplest mesons are the q-qbar mesons, where the quark and the anti-quark are of the same type. In such a q-qbar meson, there is a mixture of neutral and charged preons and we can expect the same sort of interactions between these preons as breaks the degeneracy in the hydrogen atom. Back in the 1950s, Julian Schwinger invented a version of QM / QFT that is now known as Schwinger’s measurement algebra. I’ve been working on this for years, pretty much alone. Now I have company, with an article just published by Wlodzimierz M. Tulczyjew on arXiv: Density Operators and Selective Measurements, math-ph/0711.2258.